Try to book at Chuo-ward, Tenjin. Bus and Trains Time Schedule. What's “SAKURA TANGO FESTIVAL” ? Why "Sakura Tango Festival", and what is "Sakura" ? 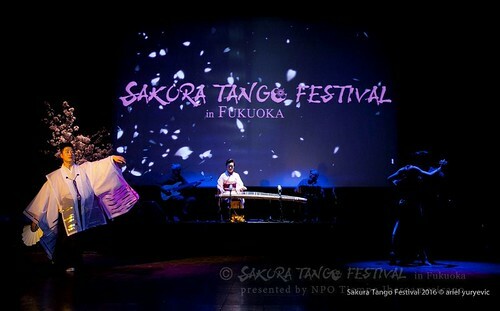 What's "SAKURA TANGO FESTIVAL" ? 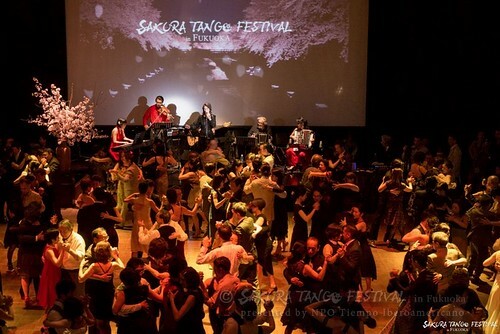 The SAKURA TANGO FESTIVAL, to be held for three days in cherry blossom season, will be a great opportunity for people all over the world who love tango and who are interested in tango to enjoy this international exchange. Argentine tango was born over 100 years ago, and it came to be known outside of the country. Mostly people appreciated the beauty of tango by listening to the music and watching the dance performances at the theatre as a form of art until about 50 years ago. However, the tango scene has since developed greatly during the past 20 years, and now people around the world enjoy tango as a way to communicate as well. Since the tango was registered on the UNESCO World Intangible Cultural Heritage List in 2009, it has become even more popular. 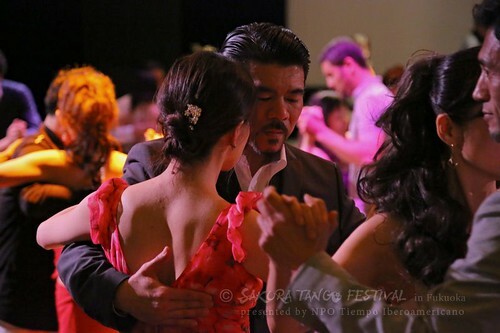 Tango festivals are now held all over the world, including Taiwan, Indonesia, China, Russia, Korea, the United States, Canada and Finland. In spite of the differences in culture and custom, tango fans from the all corners of the world visit these places and enjoy communicating through their common language of dance. 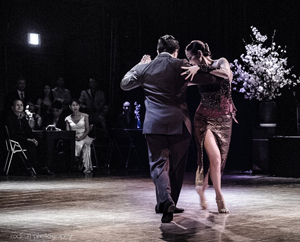 Tango has been connecting people beyond the differences of race, nationality, culture and generation. Since our establishment in 1997, we have been a pioneer in introducing tango as a non-verbal communication tool in Japan. 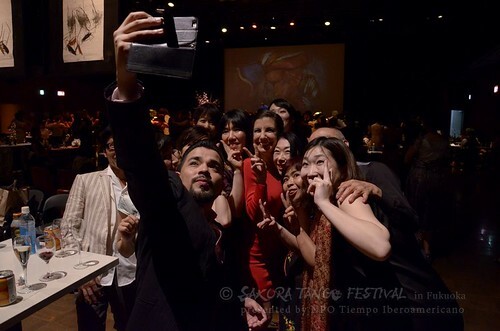 Although many people are fond of dancing tango now, in Fukuoka, the gateway of Asia, it was the first time such a great festival has ever been held, that a great many tango fans got together from all over the world. We are looking forward welcoming you in Fukuoka. • Venue Dining Event Space "TIEMPO HALL"
* Event venue will vary according to the program. • Collaborator FM FUKUOKA Inc.
For Japanese people, « sakura » (cherry tree blossom) is more evocative than other flowers, because it represents the ephemeral nature of life, and death. A short-lived yet splendid blossoming followed by inevitable fall and death. In this world, everything, from animals and trees to even mountains and rivers, has a beginning and an end: this is a transitory cycle. But if you look from another perspective, each single moment owns its particular beauty. There is beauty in the birth of something, in its growth, as well as in its final moment. This Japanese aesthetic concept is called « mono no aware » (empathy towards things) and teaches us to be sensitive to the beauty pervading everything and to value time. This is why Japanese people perceive beauty until the very last moment when cherry tree flowers fall down. Moreover, sakura blossoming corresponds to a time of the year when Japanese people are overwhelmed with feelings due to new meetings, farewells, new challenges and various changes in their daily life, because it is the transition period between the end and beginning of the Japanese academic and fiscal year. This also explains why the beauty of Sakura conveys such a special meaning to them. « Hanami » is the traditional Japanese event most awaited for in spring. People get together under the cherry trees and enjoy the full blossom. 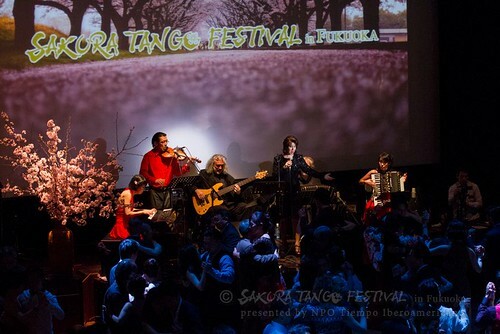 SAKURA TANGO FESTIVAL will take place during sakura blossom time. Tango is often called a three-minute romance: a conversation without words between a man and a woman. Tango lovers may enjoy this dance as an ephemeral moment of encounter and communication without words with their one-song partner. In other words, a well-danced tango may as well be compared to the beauty of Sakura. 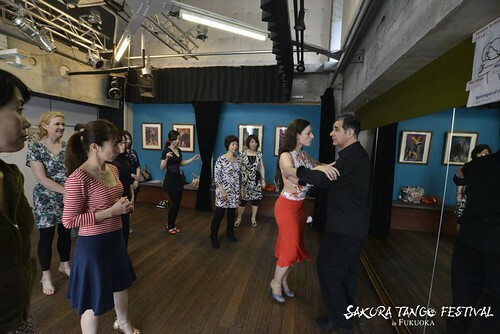 Tango lovers from various countries will get together during 4 days under the cherry trees in bloom. So it will be like “Hanami”, but with tango. We hope that this first festival will be the start of an ongoing annual event for tango lovers, for those who are able to enjoy the beauty of a dance with different people, regardless of the differences of languages, nationalities and cultures. Sharing the difference, since 1997. NPO Tiempo Iberoamericano is an organization that seeks to deepen understanding of the wide-ranging culture of ideas through various activities, from language learning to dancing, exhibitions, or food-related activities. Tiempo Iberoamericano looks to stimulate joyful and lively human communication, through which people will respect the ideas and cultures of others, strengthening their mutual understanding. We hope this mutual understanding will then become a channel for genuine international exchange at the individual, corporate and national level. On the 5th floor of the same building of the TIEMPO Hall, where the Milonga and the WS will be held, you can find SANCHO PANZA, a cafe restaurant managed by Tiempo Iberoamericano. During the 4 days of the Sakura Tango Festival when many tangueros will be together from all over Asia, Sancho Panza will offer various meals served by our international chefs. The restaurant will be filled with tango atmosphere. Enjoy chorizo, milanesa, empanadas with a glass of malbec at SANCHO PANZA and TIEMPO HALL!! We will have a day's special Argentine cuisine for lunch and dinner time at the restaurant, Sancho Panza during Sakura Tango Festival but only 3 days from Friday, March 30th to Sunday, April 1st. Also, you can enjoy having light meals such as Choripan, Empanada etc. in the intervals of workshops, so we hope you all come and make your days happier! Speaking of tango, you think of La Pampa, Uruguay and you cant think of La Plata river scene without thinking of beef!! Enjoy ASADO in Fukuoka, one of the representative Argentine dishes, on the terrace of Tiempo Hall. Big pieces of beef slowly grilled with special Argentine sauce Chimichurri. The popular sausage sandwich“Chori Pan”will be available !! Really authentic chorizo in Asia!! You can’t miss this opportunity to try it again or for your first time!! We are delighted to offer our guests who have tickets for reserved seats at Milongas a choice of three delicious dinner plates. * Please let us know if you prefer sushi without Wasabi. * The image is for illustration purposes. * Type and number of dinner plates you wish to order for which Milongas.